Belina's Adventures: For the Holidays.... Coconut Cake!!!!!! For the Holidays.... Coconut Cake!!!!!! 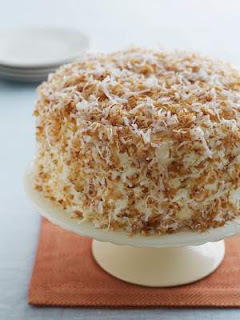 Whether you use fresh shaved coconut or the kind you can buy at your local A&P... you can have an amazing Coconut Cake for your holiday table that will delight everyone!.... I'm giving you two recipes which are killer! You can use sweetened coconut or if you have fresh coconuts on hand (you lucky devil....) you can use it as is, just shaved for easier handling, sweetened it or toast it. Some people don't like the sweetened type and toasting makes it crunchy and adds a different flavor to it, so you might consider this option, we love toasted coconut and use it in a variety of ways (Cocadas, a typical Mexican sweet is lovely and so easy to make and how about Coconut Shrimp! MMmmmm...). So let's see about these two cakes, shall we? HOW TO TOAST COCONUT: Preheat oven to 350F. Spread unsweetened coconut shavings, or sweetened shredded or flaked coconut on a rimmed baking sheet and bake, stirring once or twice, until golden, about 5 to 10 minutes. If toasting sweetened coconut, check and stir more frequently because the added sugar causes irregular browning. 2 cans (14 ounces each) regular coconut milk will be used in the cake and the frosting. REDUCING COCONUT MILK: Bring coconut milk to a boil in a saucepan over medium-high heat. Reduce the heat to medium and cook, whisking, until reduced to 1 1/2 cups. Be careful not to reduce beyond 1 1/2 cups or the solids will start to separate from the fat. Cool to room temperature; it can be stored in the refrigerator several days. For the cake: Adjust the oven rack to middle position and heat the oven to 350 F. Grease and flour two 8-inch cake pans. Mix flour, cornstarch, baking powder and salt in a medium bowl. With an electric mixer, beat butter in a large bowl until fluffy. Add sugar; beat until well mixed. Beat in eggs, one at a time, and then vanilla, scraping down sides of the bowl as needed. Beat in half the flour mixture, then the reduced coconut milk and finally the remaining flour mixture, scraping down the bowl again, until just smooth. Divide batter evenly between prepared pans; bake until golden brown and a toothpick inserted into cake center comes out clean, 30 to 35 minutes. Transfer to a wire rack and let cool 5 minutes. Remove cakes from pans; return to rack to cool completely. For the frosting: Reduce oven temperature to 325 F. Spread coconut on a baking sheet and toast, stirring occasionally, until flakes are dry and some are light golden, about 20 minutes. With an electric mixer, beat butter in a large bowl until smooth. Slowly beat in sugar until well combined. Beat in coconut milk, vanilla and salt until smooth. To assemble: Place a cake layer (top-side down, you might have to cut the top to make it even) on a cake stand lined with paper (to keep it clean while icing). 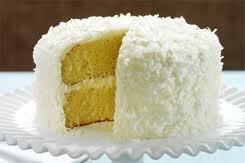 Using a knife or offset spatula, spread about 1/3 of the frosting over cake top; sprinkle generously with coconut. Place the next layer (top-side up) over the first. Spread remaining frosting evenly on cake top and sides. Sprinkle top generously with coconut. Using your open hand, gently press remaining coconut around cake sides after frosting. Remove paper; refrigerate cake until frosting sets, about 30 minutes. Slice and serve. Coconut Cake: Preheat oven to 350 F. Butter and flour two - 9 inch x 1 1/2 inch cake pans, and then line the bottoms with parchment paper (or spray with non-stick spray). While the eggs are still cold separate the eggs, placing the yolks in one bowl and the whites in another bowl. Cover the two bowls with plastic wrap and allow the eggs to come to room temperature before using (about 30 minutes). In a mixing bowl sift or whisk together the flour, baking powder, baking soda, and salt. In bowl of electric mixer, or with a hand mixer, beat the butter until soft (about 1-2 minutes). Gradually add 1 1/2 cups of the sugar and beat until light and fluffy (about 2-3 minutes). Add the egg yolks, one at a time, beating well after each addition. Scrape down the sides of the bowl. Add the vanilla extract and beat until combined. With the mixer on low speed, alternately add the flour mixture and buttermilk, in three additions, beginning and ending with the flour. In a clean bowl of your electric mixer, with the whisk attachment, (or with a hand mixer) beat the egg whites until foamy. Add the cream of tartar and continue beating until soft peaks form. Gradually add the remaining 1/4 cup of sugar and continue to beat until stiff peaks form. With a rubber spatula gently fold a little of the whites into the batter to lighten it, and then fold in the remaining whites until combined. Do not over mix the batter or it will deflate. Divide the batter and pour into the prepared pans, smoothing the surface with an offset spatula or the back of a spoon. Bake for about 35 to 40 minutes or until a toothpick inserted into the center of the cake comes out clean and the cake springs back when pressed lightly in center. Place the cakes on a wire rack to cool, in their pans, for about 10 minutes. Then invert the cakes onto a greased rack. To prevent splitting, reinvert cakes so that tops are right side up. Cool completely before filling and frosting. Frosting: (7 minute frosting) In a stainless steel bowl over a saucepan of simmering water, place the egg whites, sugar, water, and corn syrup. With a handheld electric mixer beat the mixture for 3 to 4 minutes on low speed. Increase the speed to high and continue to beat for another 3 to 4 minutes or until the icing is shiny and satiny with soft peaks. Remove from heat, add the vanilla extract, and continue to beat on high speed for another 1 to 2 minutes or until the frosting is thick. Use immediately. With a serrated knife, cut each cake layer in half, horizontally. (You'll have 4 cake layers) Place one cake layer on your serving plate and spread with about 1/3 of the lemon curd and sprinkle with about 2 tablespoons of coconut. 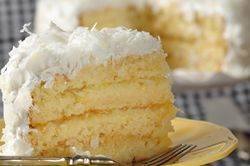 Continue with the next layers, stacking and filling with the lemon curd and coconut. Frost the top and sides of the cake with the 7-Minute Frosting and then sprinkle with about 1 cup of coconut. Cover and refrigerate the cake until serving time. Lemon Curd: In a stainless steel bowl placed over a saucepan of simmering water (Bain Marie), whisk together the eggs, sugar, and lemon juice until blended. Cook, stirring constantly (to prevent it from curdling), until the mixture becomes thick (like sour cream or a Hollandaise sauce). This will take approximately 10 minutes. Remove from heat and immediately pour through a fine strainer to remove any lumps. Cut the butter into small pieces and whisk into the mixture until the butter has melted. Add the lemon zest and let cool. The lemon curd will continue to thicken as it cools. Cover immediately (so a skin doesn't form) and refrigerate until cold. The lemon curd can be made several days (up to a week) in advance.